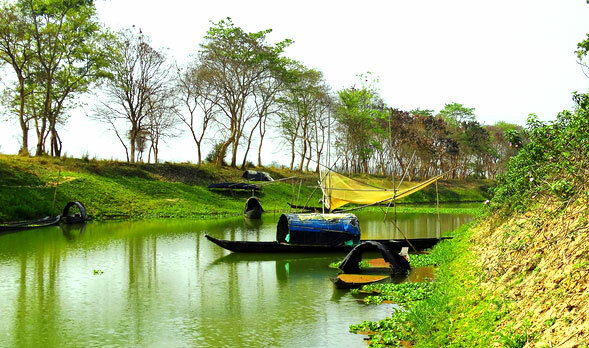 The town of Jorhat is located 314 km from Guwahati astride NH 37. It is a good link between lower Assam with upper Assam as also North Arunachal Pradesh and Nagaland. It has a connection by road, railway and air to other parts of Assam and major cities of the country. There are Assam state transport Corporation as well as private buses which operate in this sector. Jorhatis connected to Guwahati by a direct rail line. There are direct flights from Guwahati to Jorhat and other parts of the country. The Vaishnava Satras were founded by Sankardeva, the father of Assamese culture. The historic and auspicious ‘Manikanchan Sanjog’ was the first Satra in Majuli. Subsequently 65 satras grew which propagated the ethnic and sociocultural ideals. At present there are only 22 Satras in Majuli and rest have been shifted to other safer places due to flood and erosion. These Satras are the treasure house of ‘Borgeet’, Matiakhara, Jumora dance, Chali dance, Noyua dance, Nande Vringee, Sutradhar, Ozapali, Apsara dance, Satria Krishna dance, Dasavater dance etc. which were contributed by Shri Shanjerdeva. Dakhinpat Satra was founded by Banamalidev, an exponent of Raasleela, which is now observed as one of the State festivals of Assam. This Satra was founded by Lakshmikantdeva. During Autumn end traditional Raasleela is performed with great enthusiasm. Some ancient weapons are also preserved here. Founded by Niranjan Pathakdeva, this satra is famous for ‘Paalnaam’ and Apsara dance and it also has considerable collection of old Assamese utensils, jewellery and handicrafts. Kamalabari Satra founded by Bedulapadma Ata, is a center of art, culture, literature and classical studies. Its branch Uttar Kamalabari Satra has performed cultural programme of satria art in several states of India and abroad. It is a store house of culturally important antiques and an advanced center of performing arts. Muraridev, the grand son of Shankaradeva’s step mother, had founded the SSwargadeoatra. The royal robes belong to the Ahom king Swargadeo Gadadhar Singha, made of Gold and an umbrella which is also made of gold, are preserved here.